Writing an Autobiography! Made Easy! Penny Book! This product is one of my favorites, designed to teach kids how to write an autobiography for beginners and it's fun too! This can be done with a range of grade levels and writers. The focus is autobiographies and you can make it as in-depth as you want! I always start with the read-aloud of The Hundred Penny Box, in which, the main character collects pennies with significant years that she associates with memories. It is a great mentor text to get kids ready for the Penny Book project! 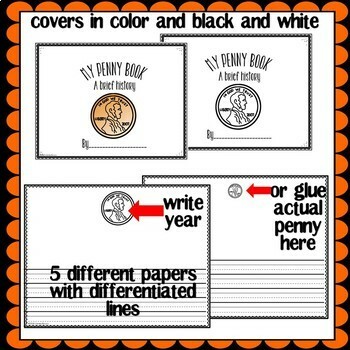 The Penny Book project has 3 components to it. During the first part, your students will collect pennies from each year of their lives. Next, either with the help of a parent or guardian, they will use the included graphic organizers to jot down memories associated with each penny. 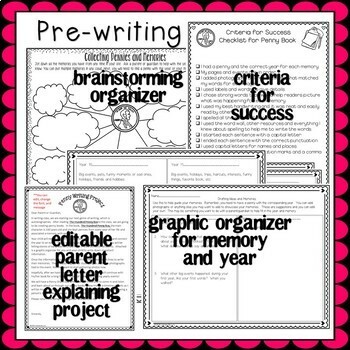 I have included a brainstorming graphic organizer and one that gives ideas to help target a specific memory. The next phase is writing about the memories in their penny book by using their graphic organizers. 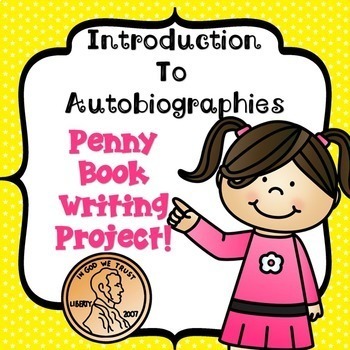 The kids glue down the corresponding penny onto the book and then write about the memory or if you choose to not have the glue down an actual penny, I have writing paper where there is a penny without a year. This way, you can have them write the year instead. I have included five different forms with various lines on a page which will allow you to differentiate the paper for your particular learners. The last phase of this project is the Penny Share Day! I believe in celebrating writing as a way to motivate kids and give them a purpose for writing. Parents or caregivers are invited to come and listen to the students’ writing. They are also asked to bring in 2-3 pennies from their own life that they can share with the students. I created groups of 4-6 kids so that kids are only sharing with a small group of adults. They are not presenting to the entire group of adults. An alternative is to set up kids in a way that parents rotate around to 4-6 kids. It’s up to you. The best part of the celebration is the feedback the kids receive from the listener (adult). I have created three different ways to collect feedback. 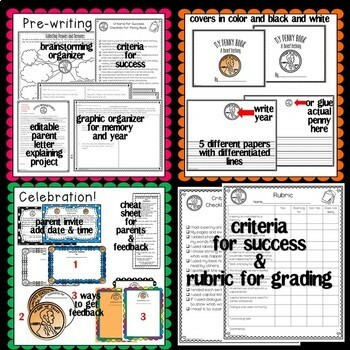 Kids can pass out slips of paper (included) or use clipboards where there is one sheet per child (included) OR you can create large penny books for comments (included) for adults to give their feedback. Again it is your choice. I always provided refreshments and made it a very big deal! Fairy Tale Mail Letter Writing Project! **I hope you will consider following me for new releases, updates, and freebies!